On July 4, 1054, a supernova was observed by astronomers and stargazers across the Northern Hemisphere, and possibly Australia. Its remnant, the Crab Nebula, is among the most-studied objects outside our Solar System. This gorgeous, classic view of the Crab Nebula is actually a composite of 24 images. Colors indicate the different elements expelled when the star that created the nebula went supernova in 1054. Blue in the filaments in the outer part of the nebula represents neutral oxygen, green is singly-ionized sulfur, and red indicates doubly-ionized oxygen. The rapidly spinning neutron star embedded in the center of the nebula is the dynamo powering the nebula's eerie interior bluish glow. On July 4, 1054, a supernova (SN 1054) was observed by astronomers and stargazers across the Northern Hemisphere, and possibly Australia. Its remnant, the Crab Nebula, is among the most-studied objects outside our solar system. A supernova is one of the most explosive events in the universe. A supernova occurs when a massive star runs out of nuclear fuel (mostly hydrogen and helium). The core of the star collapses, violently ejecting its outer envelope of material into space in a huge shock wave. 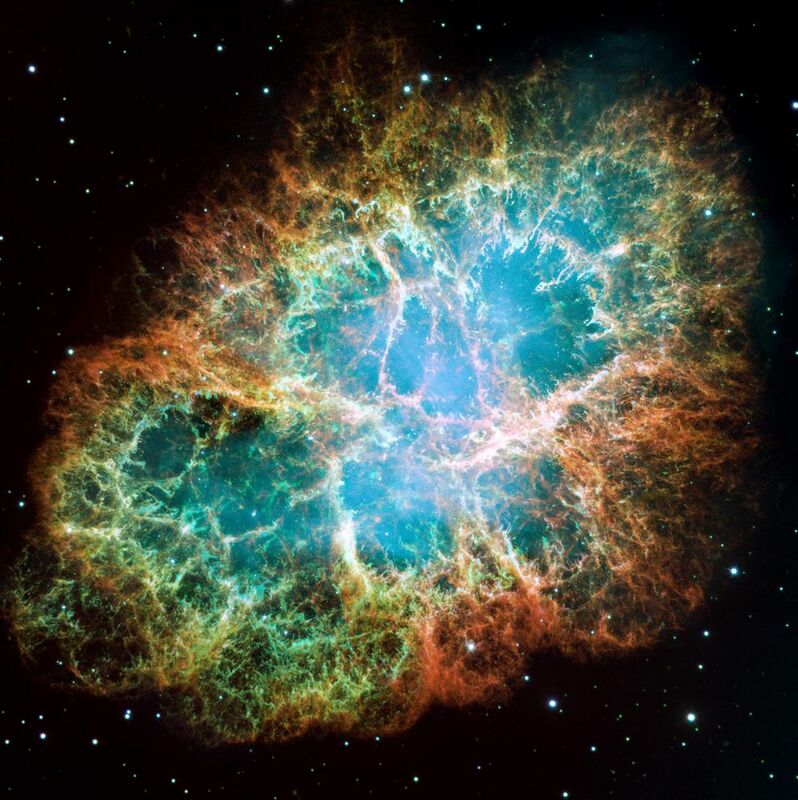 These blast materials are the filaments still visible as the Crab Nebula. The star that went supernova in 1054 was so massive that it left only a rapidly rotating ball of neutrons called a pulsar. The Crab Pulsar is only about 20 kilometers (12 miles) in diameter, but has a mass greater than the Sun! The Crab Pulsar pulses, or spins, about 30 times a second. SN 1054 was visible as a bright, glowing star for about two years! Astronomers in China, Japan, and what is today Iraq recorded the event. Some historians think that petroglyphs left by Ancestral Puebloans may also have recorded SN 1054. Other historians think the oral tradition of Aboriginal Australians may also refer to SN 1054.
material found in a roughly spherical shape around a star. particle in an atom having no electrical charge. history, characteristics, and mythology of a culture transmitted through vocal, not written, methods. rapidly spinning neutron star that emits beams (pulses) of radiation. to direct attention to something. sudden, violent explosion of a massive star.